Coming from a company like Incra I expected this item to be one top of the line rule. I was wrong. Throw in the excessive cost and in my opinion we have an item that can be passed over for something better. The measurement increments are accurate and as specific as can be. However, this rule is stamped from very flimsy material that easily bends and gets pulled out of alignment. 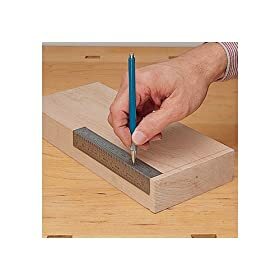 This defeats the point of this item since it is designed to sit alont the edge of your workpiece and help mark more than one side at once. The fact that it bends and flops just begs for an inaccurate measurment. Once a rule is bent, the validity of its measurments are in question. The particular piece I received was bent when it came out of the box. I called and a replacement was sent quickly. But the replacement was no more substantial than the first one. One bump from the wrong direction and this rule will fold like a soda can. I would not recommend this item at all until they either make it from a thicker or stronger material or drop the price considerably. For $37 you can buy a lot of other, dependable measuring devices. Charles, thanks for the review. I have always had a great deal of respect for Incra products but would definately cross one of these off my list, based upon this review. I was thinking of buying on of those.. now thanks to you and your review.. I will not.. thanks for posting this and so sorry it the tool was not up to par with a quality tool.. can you send it back for a refund? i have several of the incra rules and love them all, including the 1000SE miter gauge. i’ve looked at the model you reviewed several times and just could not bring myself to lay down the cash, and i did notice it seems suceptable to bending. thanks for the review, now i can stop picking it up at the local Rocklers. Ditto to the rest…thanks for the review, I also was thinking about getting one someday….not now. I also have a great many INCRA products and they are all very well made and accurate. Degoose. Thanks for the input. Just to clarify and not to start an argument but this is specifically the 18” version of the bend rule. The picture provided on Amazon is the same for the 6” as well as the 18”. I have the 6” as well and it is a little sturdier because there is not as much material to pull it out of form. I just bought this at a garage sale for $7. I would have never spent $30 on this but now that I have it and have used it… I love it! It is a thin flexible metal so you have to be careful with it but its accuracy and ease of use is terrific. I now think its worth the $30 that I luckily didn’t have to pay for it. I can see where the corner marking ruler would not be desired because of the same flexing. It seems that you would only be able to mark corners on material that is milled with sharp perfect edges? A customer once mentioned that the rule is made of very, very light-weight metal and bends at the slightest pressure. When he received the product, he said that it was bent before it went into the shipping box. He was not quite satisfied and asked for another replacement. Still, INCRA is a well accepted brand overall. Just this specific product that people seem to have issues with the most due to the material and they were expecting more quality from INCRA. Incra’s products first caught my eyes some 15 years ago. As I could not afford much of anything back then I decided to wait and wait and wait. Having waited as long as I did caused two things to happen, firstly I got a chance to see the development of this companies products and secondly and most unfortunately it caused such a vented want for the product, I mean who would not want that kind of accuracy, not to mention that awesome perfect gold or red finish they have on many of their products. In any case when time came I not only purchased one or two things, i bought literally everything they had to offer. I would also mention that this was a year ago and so I have had an opportunity to use the products quite a bit. Having gone through this would I recommend many of Incra’s products,,,,I would but with a disclaimer. !!! Be very gentle!!! . Having a 35 dollar ruler bend on the end is not my idea of fun. Rails on their table saw system scratch because you happen to pull back a little two fast and it would bind and as a result scratch. I would also like to add that I spoke to customer service at Incra and they did try to accommodate. The issue I had was that imp not sure the man on the other end was quite getting me or maybe he was not listening or quite possibly he new well of the issues of his products but was trained not to admit fault of any kind. ,,,Bottom line had I known right at the begging that I had to baby these products I still would have purchased these products because I like , love how accurate these products are, especially the table saw fence system, I just would have made sure to be careful and take it easy with these tools. I have the 12” inch set (the T-square, the corner one and the regular flat one) and I agree that they are flimsy. I believe it comes from the fact that they have to be made of really thin material to have the accurate slots and holes. Laser cutting cuts conical shape holes and the thicker the material, the greater the diameter difference will of a hole between the two opposite faces. I just take extra precaution when dealing with these tools, just like I do for squares and other expensive tools. 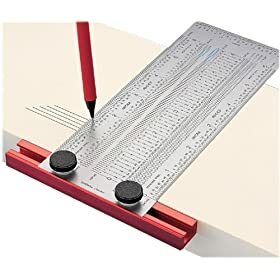 I use them when I need precision that other measuring tools cant provide. I have the 6” version and I absoutley love it, I would hazard a guess that this one is just too long.